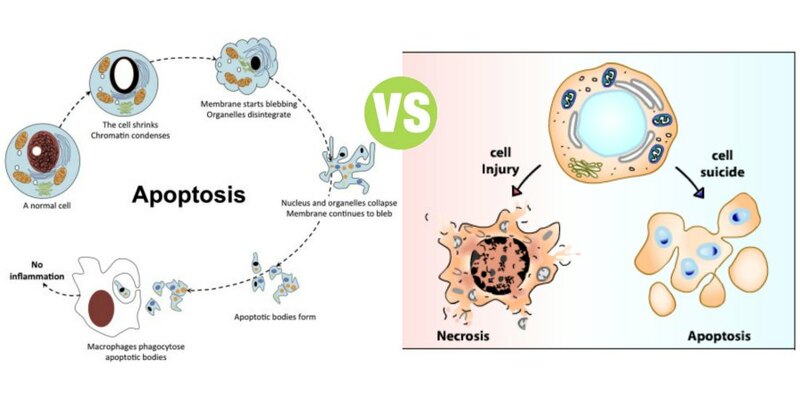 Summary: Difference between Apoptosis and Necrosis is that Apoptosis is defined as the natural or programmed death of the cell under genetic control. Originally, apoptosis refers to the process by which the leaves fall from trees in autumn (In Greek, apoptosis means ‘falling leaves’). While Necrosis (means ‘dead’ in Greek) is the uncontrolled and unprogrammed death of cells due to unexpected and accidental damage. It is also called ‘cell murder’ because the cell is killed by extracellular or external events. Apoptosis is defined as the natural or programmed death of the cell under genetic control. Originally, apoptosis refers to the process by which the leaves fall from trees in autumn (In Greek, apoptosis means ‘falling leaves’). It is also called ‘cell suicide’ since the genes of the cell play a major role in the death. This type of programmed cell death is a normal phenomenon and it is essential for normal development of the body. In contrast to necrosis, apoptosis usually does not produce inflammatory reactions in the neighboring tissues. An essential event during the development and in adult stage. Apoptosis is activated by either withdrawal of positive signals (survival factors) or arrival of negative signals. Exposure to agents like chemotherapeutic drugs, X-rays, ultraviolet rays and the death-receptor ligands. Death­-Receptor Ligands are the substances which bind with specific cell membrane receptors and initiate the process of apoptosis. The common death-receptor ligands are tumor necrosis factors (TNF­ α, TNF­ β) and Fas ligand (which binds to the receptor called Fas). Death­receptors are the cell membrane receptors which receive the death-receptor ligands. Well-characterized death receptors are TNF receptor-1 (TNFR1) and TNF-related apoptosis inducing ligand (TRAIL) receptors called DR4 and DR5. External or internal stimuli initiate apoptosis by activating the proteases called caspases (cysteinyl-dependent aspartate­specific proteases). Normally, caspases are suppressed by the inhibitor protein called apoptosis inhibiting factor (AIF). When the cells receive the apoptotic stimulus, mitochondria releases two protein materials. First one is Cytochrome C and the second protein is called second mitochondria-derived activator of caspases (SMAC) or its homologudiablo. 3. Neurodegenerative diseases like Alzheimer’s disease. Necrosis results in lethal disruption of cell structure and activity. The cell undergoes a series of characteristic changes during necrotic process, viz.